For fans of selfie there are some places of interest for those who have a hobby berfoto ria. In the area of Semarang and surrounding areas, there are currently some places that are popular to become a swafoto event aka selfie. The place is considered unique so interesting if immortalized as a photo background. 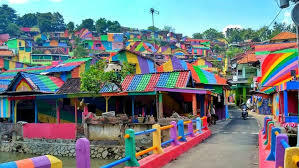 Kampung Pelangi is located in Gunung Brintik area, Semarang City. This place was originally known as a slum and densely populated area. But the "sighting" of this village successfully conjured up with colorful paint so that it becomes interesting. So interesting, many travelers who come to enjoy the atmosphere there and of course and self-ria. Seeing the development of the city government intends to add support facilities, namely in the form of parking lots and arena of food (foodcourt). This is a sand and rock mining area located in Tembalang, Semarang city. This place became a hunt for photography enthusiasts because the nuances and panoramas are different than other city corners. The place was nicknamed Brown Canyon. At Brown Canyon, the action of taking pictures with the backdrop of a paved hill becomes the main agenda of the hunters unique places. They can at once feel the sensation of natural scenery like in the Grand Canyon in Coloradao, United States. Brown Canyon is located in District Tembalang, Semarang City, Central Java. From the city center, the distance is approximately 15 kilometers to the southeast. 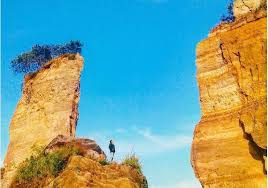 The main treat is a panoramic view of the cliffs from the former mining that refracts the unique colors due to exposure to sunlight.In the afternoon, the sky of Semarang city, which was once bright, will begin to turn blue. This makes the color of a brown cliff combined in contrast to the shade of the sky. Then, as the sun began to search for its hiding place, the expanse of sky slowly turned to orange. A series of moments are certainly a soft target photography hobbyists or self-crazy ones.You are not recommended visiting that location during the day. The weather of Semarang City is hot and the dust from the carrier trucks can disturb the comfort. 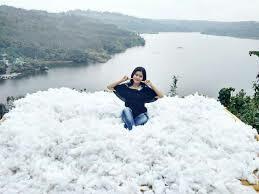 This place is located in the village of Talunkacang, Gunungpati, Semarang. Locals who have the idea to mengggarap some point in the region into a location deserve selfie, because it has a charming view.One of them is a point that is considered interesting is that has a view to the stretch of Jatibarang Reservoir.In place there is a construction of bamboo material as a buffer equipped with a dacron as a decorative cloud. So when the photographer really seemed to be on the clouds. The height of the swafoto point is about 3-4 meters so it is quite risky if it rains. Manager temporarily closes this mejeng location if it rains.In the near future the manager will add a new point with the theme of Snow House to further boost the popularity of Talunkacang VillageSara Laraswati, 24, one of the visitors admitted the beauty of the place. ">"The scenery is good for selfie, but the money is cheap, only Rp5.000.No think there is a tourist destination like this," said the student of Semarang State University (Unnes). Indonesia is rich in places of tourist attractions, not to mention the disemarang tourist places mentioned above. Not wrong if Indonesia can be said paradise tours worth visiting overseas tourists. 0 Response to "Here are 3 Amazing Destinations From Semarang"